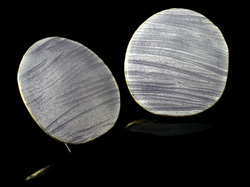 Randomly textured and enamelled ovals ear studs. Having chosen lavendar/purple as part of my colour scheme, I thought it was time to also put that colour into some jewellery. Problem is, while these ear studs really do have a subtle purple hue, they don't look like it when put on a page with so much other purple around. The studs are produced in much the same way as	these plain silver ones, with the same random effect to both the pattern and overall shape, but this time I mounted them on ear pins rather than hooks.